If you’ve found this website, you already know a great assessment platform when you see it. However, when you pair great software with high-quality content, you create a truly phenomenal assessment experience. Below are just some of the benefits educators and their students experience when they take advantage of this type of partnership. The most impactful thing an educator can do is help improve student outcomes. While writing exam items is an appropriate method of assessing student learning, wouldn’t it be more beneficial to students if faculty could spend that time teaching them? By using the vetted publisher content that is pre-tagged to appropriate outcomes, faculty save the time they would have spent writing and editing their own exams. Now, pair this content with an assessment tool that will automatically upload everything into the exam creation software for you—and you’ve got a recipe for time-saving greatness. There is a certain level of trial and error associated with writing new items—but this process isn’t necessary when you’re using highly vetted items from experts in their fields. By using publisher-created assessment items, educators have the peace of mind knowing your multiple-choice items and rubric evaluations have already been through that trial-and-error process. Wait, did we just save you time again? Yeah, we did. OSCE cases that can be customized into multiple versions are just another measure faculty can use to save time while simultaneously ensuring assessment security. Exam security is more than just locking down students’ computers—it also means easily creating “new” assessments by making tweaks to these prequalified case scenarios and their associated rubrics. Keeping your exam items secure (and thus, valid) is easily accomplished by having a secure, cloud-based item bank and also refreshing content periodically. To be effective, student assessment feedback should be timely and meaningful. We already know having all assessment items pre-tagged to learning outcomes saves precious preparation time. It doesn’t stop there though—this process sets everyone up for success by driving efficient post-assessment distribution of targeted feedback with just a few clicks of the mouse. Now, students have the information they need to be successful moving forward, and faculty have more time to work with them. Wait, this all helps with accreditation too?! Having items pre-tagged to both learning objectives and your program outcomes provides ready-made mapping for accreditation. We all know how much “fun” preparing for accreditation can be—do yourself and your program a favor and make sure you’re working toward that goal from early on with valid, publisher content and a great assessment software. 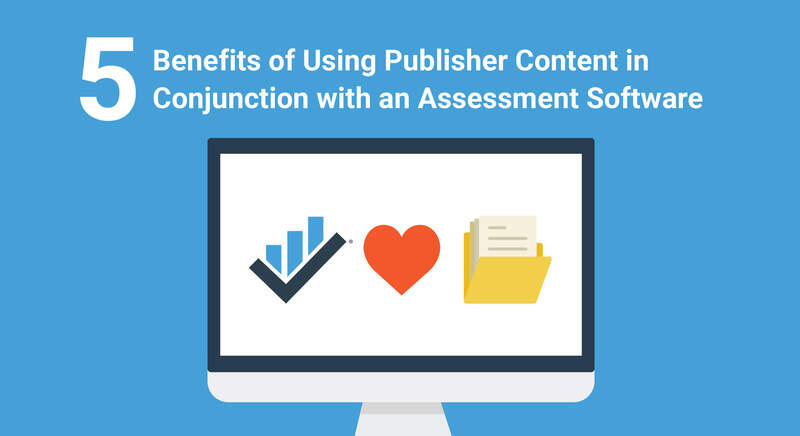 Learn more about publisher content from ExamSoft here.